Colds, they are like the worst thing known to man! Like seriously! You are not ill enough to be off work or school so you have to trundle in, practically dying for no one to give you sympathy! You get on with your work ( the best you can) watching the clock move the slowest it has ever done because all you want to do is GO BACK TO BED! So today, with winter fast approaching, here are 9 ways you can successfully beat a cold, enjoy!
" How can you prepare for a cold? What the hell is she on about?" " Don't be daft!" I have not gone mad madder! If you wake up one morning with a sore throat, you have probably got a cold coming. If that same sore throat is there in the evening, yeah you have got a cold coming! What you need to do is cancel all your plans for Tommorrow ( and probably the next day as well) Do as much as you can now, because well you are going to feel like death tomorrow! So you are woken up with that cold, I was right! You feel like death, your throat is as dry as gravel- what you need is a throat sweet. We all have our personal faves, mine just happens to be jakeman's! And no this isn't sponsored, but if anyone at the jakeman's factory, want to hit me up, my email is my contact page! Seriously though, the lemon and peppermint ones are a delight! No one wants to look like Rudolph the reindeer, so although I could say let it drip, that sounds utterly disgusting and just a completely wrong way of not getting a red nose! Instead use the softest tissues you can find and that will help you avoid being tracked down by Santa to help deliver presents this year! Okay, so you have been sent home from work or school because well to be completely honest you were just scaring everyone! You need something to do with your time, MOVIES! Now you can't just go about watching any old movie when you are ill! You can't go around watching the king's speech or apollo 13-you need some guilty pleasures, mean girls, high school musical, Disney or pitch perfect are a few of my recommendations! For me, paracetamol and ibuprofen do well, to put it politely, very little. You need rest and to sit down and feel sorry for yourself. Now unless I am mistaken drugs can't do that for you. Avoid putting something else in your immune system, colds are best beaten naturally! Yeah okay, I know not always possible but seriously if you can go at the weekend or you live nearby the beach, the sea air does wonders to head colds. A number of times I have had a cold and we have been down to the beach and the next day it is practically gone, it is amazing! Most of the time in life we get to get on with it and you could argue it's the same for having a cold! But if you are in work or school and people keep saying: " oh you look really ill! Do you want me to get that for you?!" " Oh, you should really go home!" SOAK IT ALL IN! Let's face it, people don't even know you are there most of the time! I know waking up in the morning knowing that you are going to feel pretty terrible tomorrow is no fun at all, so you need to be prepared. ( "Enough of the preparing already!" I'm sorry) Before you doze off to bed put Vic or vapour rub under your nose and on your chest. This stuff smells pretty vile, but it does help you breath during the night. It works the same as tipping your head over a steaming bowl of water, but you know ain't nobody go time for that! If you have a cold, I hope that has given you some helpful advice, well kind off! 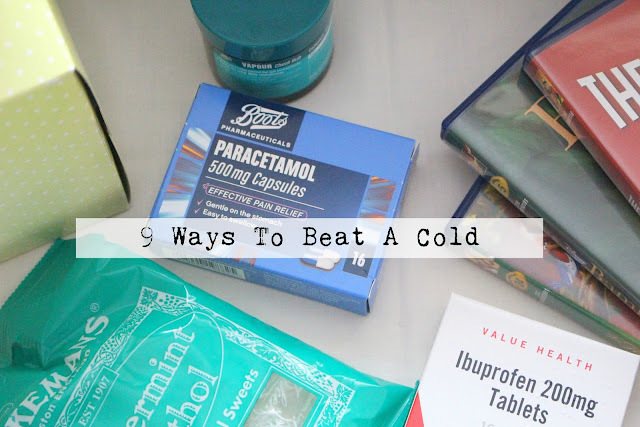 Do let me know what you use to beat a cold, in the comments below!? Great post! I have had a terrible cold the past week it just won't go! I think this is going to come in handy in the very near future, I'm surrounded by people with colds and surprised I haven't caught one yet!! Those are great tips. I like having a cold when I´ve got the time to take a step back because it gives me an excuse to just sit in my bed and watch movies or Youtube all day. (not that I wouldn´t do that on a sunday anyway). I have also come to the conclusion that using chapstick on your nose helps a lot with the redness as well. These are great tips! I always feel sorry for myself when i'm bunged up with a cold! I think taking vitamins to strengthen your immune system is the best way. You'll catch everything working with children, but after your first year your immune system will strengthen. Good Luck! I hate having colds (and being ill in general), I always Google ways to get rid of a cold, haha. I'll definitely be using these tips!